My Main Man has been called both a politician and a public servant, and, in any case, holds local elected office. That makes him a local legislator. Because of this, I've had the privilege of tagging along twice at the annual Fayette County Farm Bureau Legislative Appreciation Dinner. I'm pretty sure I went to similar dinners in beautiful Wayne County as a child, held in the old cafeteria at Wayne County High School, and featuring Mrs. Gholson's unforgettable homemade yeast rolls. 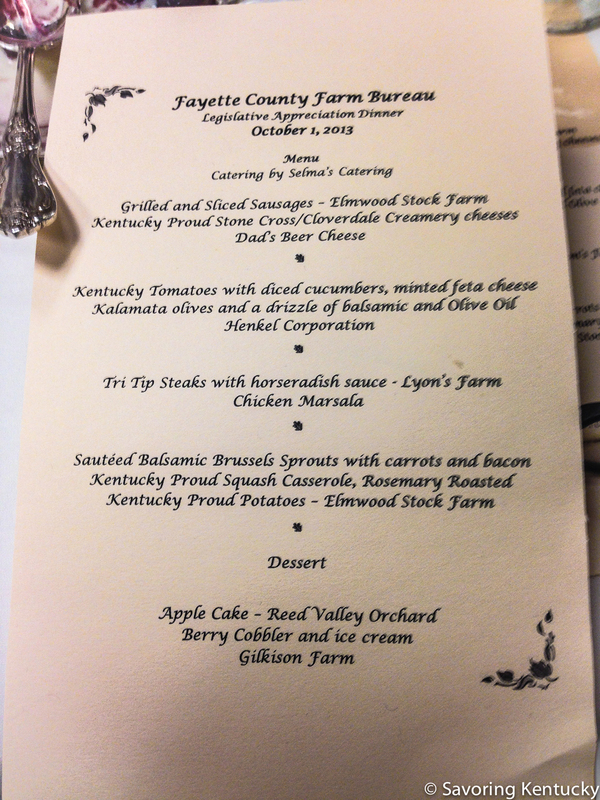 Both the 2012 and 2013 Fayette County Farm Bureau dinners proudly featured Kentucky food. This year, Selma's Catering prepared the delicious meal. I heard particular exclamations over the Brussels sprouts and the berry cobbler. I'm headed toward an observation that this dinner illustrates, but first, here's the menu. As one who longs for Kentuckians to embrace our land and food in order to build self-sufficiency and resilient local economies, I puzzle over our different ways of valuing our own farms, farmers, cooks, chefs, and products. It seems to me that mainstream Kentucky cherished the work of our own hands and the products of our own land until about the 1950s, when we joined the advertising-induced, corporate profit-driven national confusion about national brands being cleaner and better. Most of us—but not all—lost our way. If I could pinpoint Kentuckians' mainstream thoughts about building a local food and agriculture economy right now, I'd say we have turned back toward Kentucky goodness, at least for special occasions. Farm-to-table dinners like the one at Cedar Creek Vineyards in Pulaski County last week are stretching into more parts of the Commonwealth. Special meals at conferences feature Kentucky food. Special meals on university campuses highlight local specialties. Some public schools feature an occasional Kentucky product in some school meals. For most of us, though, everyday life still runs on a different assumption: buy cheap; embrace convenience. I look forward to the time when every meal, every menu, every special occasion, every takeaway gift, every flower arrangement, every raffle item—all of it—comes, by assumption and habit, from Kentucky lands and hands. Some people have been living among us, quietly pointing us toward this ethic for a long time. Here's one example. Along with vegetables, fruits, homemade breads and pawpaw plants, Roland MacIntosh brings Kentucky agate, both polished and natural, to the Lexington Farmers' Market each week, and has for years. Maybe decades. In his steady, inimitable Roland way—it's an entirely Kentucky way, as well—he shares this Kentucky beauty generously. Roland matches his offering of information and expertise to a curious person's apparent level of interest, never using force or hype. Also for years, if not decades, Rachel Savané has been making some of the world's most exquisite jewelry featuring these stones. Now Roland and Warren Anderson have produced a new book, published by the University Press of Kentucky: Kentucky Agate: State Rock and Mineral Treasure of the Commonwealth. Perhaps what's happening, and has always happened, is that thoughtful individual Kentuckians keep their heads and values intact no matter how commercial mainstream culture pulls at them, but institutions and groups are another matter. Roland MacIntosh and Rachel Savané grace a long list of wise Kentuckians who never lost their way. Of course we head that list with Wendell Berry, about whom more in a moment. But I'm also thinking of Kentuckians like Betty Decker, Lloyd and Beatrice Jones, and Winthrop and Celia Hopson, all of whose ways of farming and living demonstrate commitment to timeless principles of stewardship, self-reliance and wise use. These leading lights are among us, though most, like Roland MacIntosh, manifest that endearing Kentucky characteristic of diffidence, unwillingness to make others wrong or call undue attention to oneself. That particular cultural habit of Kentuckians may also slow down our pace of change. We famously expect the world to end 10 years later here than anywhere else. And I'm often confused about whether our particular pace is a strength or weakness. This much seems clear: when institutions and large groups adopt change, the pace accelerates. We have some years of experience with this principle now. Nearly 10 years ago, Bob Perry tried to bring local food purchasing to Kentucky's state parks, had some success, and then the change did not fully take hold. About seven years ago, the city of Louisville, pushed by Wendell Berry, began investing in strengthening the regional food economy to increase food security. Since 2009, Louisville Farm to Table, coordinated by Sarah Fritschner has worked to build relationships between regional growers and institutions like hospitals and higher education. That same Main Man who opened this post is at work to bring a starter version of this work to bear on efforts to strengthen central Kentucky's local food economy. Tomorrow night, October 4, 2013, Bill Moyers will air for the first time Wendell Berry: Poet & Prophet, based on an interview he conducted with Wendell Berry at St. Catharine College earlier this year. We turn, at our Kentucky pace, toward a stronger, richer set of habits, and toward greater health for our land, people, communities, and economy. I am grateful to be a witness.